For the first time when me and a friend visited Briós, a nice cozy cafe located at Pozsonyi Street, we were so hungry, that we were shaking to hear about the menu, but the offer was too good to decide fast. Finally we succeeded, ordering 4 dishes which saved our life. Thank you! 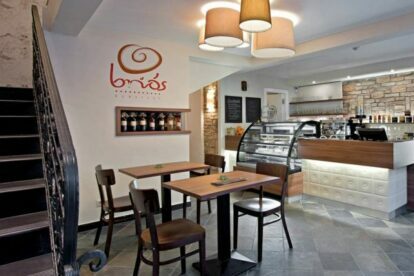 Briós is a friendly and cozy cafe, just the right place to have a breakfast out of home. It is a simple and friendly spot run by a family, who was traveling a lot and wanted to show what they think about hospitality. Nóri the owner, who is a mother of 3, wanted to open a child friendly spot, where menus appeal to both children and adults alike. Briós managed to build its reputation really fast, not only because upstairs there is a playing space with activities to keep kids playing while their parents enjoy their meal, but also because of the open minded atmosphere, not to mention their excellent coffees. They offer a satisfying menu from which it’s hard to decide. They offer omelettes, baguettes, salads, bagels, lunch menu and marvelous desserts – I bet on the brownies, but carrot cake is also a big favorite. But they also have a nice wine selection for those who desire peaceful moments on their new terrace which is open from April. I guess if you are on holiday to Budapest, you don’t want to prepare breakfast at home, so Brios is worth a visit!